Those trysting places were not always accessible though - sometimes nature thwarted Dafydd's desires. Finding the River Dyfi in spate he composed a song in its praise in the hope that it would allow him to cross. On another day it was mist that descended just as the poet was setting out for a liaison with a slender maid. Here are some lines from the translation of Y Niwl ('The Mist') by Rachel Bromwich (from my book, pictured above, sadly no longer in print). Even in English I think they convey a vivid sense of fog on the Welsh landscape. coat-armour of the oppressive shower. This autumn the Royal Academy will have a major retrospective exhibition for Anselm Kiefer. Back in the eighties, when I was a teenager and first discovering contemporary art, Kiefer was a really big name. In fact there were a group of German artists that seemed almost as well known as the Americans: Beuys, Baselitz, Polke, Richter (these last two had a nice joint show in London earlier this year). In those days Robert Hughes would write witheringly about the latest stars of the New York art scene but considered Kiefer the best painter of his generation. Then came Simon Schama's Landscape and Memory (1995) - familiar I'm sure to readers of this blog - which discussed Kiefer's work in relation to the German forest. But since then it has seemed as if he has faded into the background somewhat as waves of new artists have come to the fore. When I have thought of him, it has been to imagine him still holed up in the south of France, where he moved in 1992, gradually turning an old silk factory and its surroundings into a vast Gesamtkunstwerk. However, watching Sophie Fiennes' documentary on Kiefer recently, Over Your Cities Grass Will Grow (2010), it was obvious that he remains a massive presence in the global art world. The film ends with his relocation to Paris and Kiefer looking forward to easy motorway access to Germany and a large studio that had once been the depository for the La Samaritaine department store. Fiennes's camera tracks slowly around its bunkers and underground passages with their pools of water, shattered urns, piles of broken glass, puzzling numbers on the walls that evoke the tattoos of concentration camp inmates and so on. Her visual style brings to mind the lengthy contemplative shots in Tarkovsky's Stalker, Nostalgia and The Sacrifice, and we think of blitzed cities, battlefields, the death camps, the post-industrial world and the impermanence of civilisation. The film's title is a quotation from the Bible and one inevitably remembers Eliot's line in The Waste Land: "These fragments I have shored against my ruins." Perhaps the most memorable scene comes near the end where the camera rises slowly to reveal a vista of concrete towers under grey skies. Earlier we see Kiefer directing their construction - he does it all by eye. Two similar towers were built for an installation in the courtyard of the Royal Academy in 2009 and a laser was installed to detect the slightest movement and sound an alarm if it looked like they might be about to collapse (it never went off). Fiennes says in the commentary to the film that this ruined landscape reminds her of modern war zones like Gaza. It is sad to think that she would have been referring then to the 2008 conflict while as I write this there is a new war creating new ruins. Now, again, we are watching footage of twisted metal, shattered glass, tunnel networks and concrete towers: the destruction of real buildings and real people's lives. In the spring of 1188 Baldwin, Archbishop of Canterbury, set out to travel through Wales recruiting men for the Third Crusade. 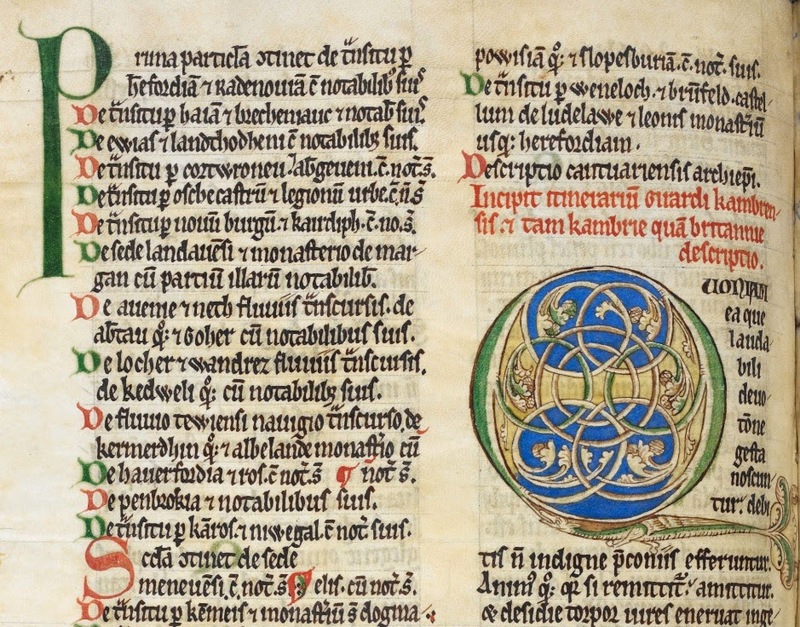 He was accompanied by Gerald, Archdeacon of Brecon, whose highly readable account of their journey, Itinerarium Kambriae (The Journey Through Wales, translated by Lewis Thorpe), contains many interesting references to nature and topography. I have always liked the abecedary form (as in, for example, Kevin Jackson's collection of alphabetical essays Letters of Introduction) and have used it here to list some of the places, sites and unusual natural phenomena Gerald wrote about. 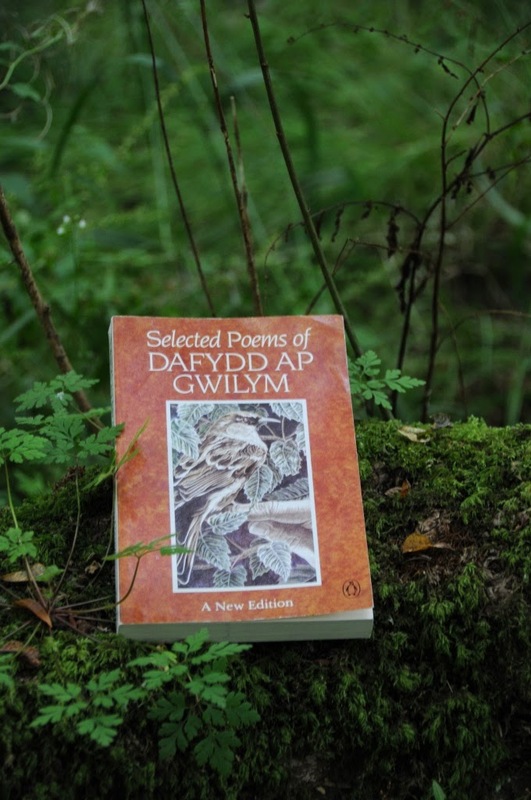 What follows therefore is an A-Z of the Welsh landscape towards the end of the twelfth century. I is for the mountains of Ireland. These can be seen on a clear day from St David's and Gerald writes that when William Rufus came to this spot and looked across the sea from the headland he said "I will collect a fleet together from my own kingdom and with it make a bridge, so that I can conquer that country." Gerald himself had been in Ireland for a year, travelling there as chaplain and adviser to Prince John in 1185. The Journey Through Wales was Gerald's third book, written after two books on Ireland. J is for Jerusalem. Gerald had himself taken the cross and his whole party expected to leave for the Holy Land when their mission in Wales was complete. In 1189 he and Archbishop Baldwin sailed for France but Gerald was sent back to England by the new king Richard, following the death of Henry II. Baldwin went on and died at the siege of Acre in 1190. Two years earlier, as he and Gerald approached Bangor along a valley with many steep climbs, they had dismounted in order to practise walking in the exhausting conditions they expected to find on the road to Jerusalem. 'We walked the whole length of the valley and we were very tired by the time we reached the farther end. The Archbishop sat himself down on an oak-tree, which had been completely uprooted and overturned by the force of the winds, for he needed to rest and recover his breath.' He asked for a tune to soothe his tired ears and a bird in a near-by coppice started to sing. K is for the knight and the King. Gerald tells of 'a knight from Brittany' who was sent by Henry II to see how the land round Dinevor Castle was fortified. He was conducted by a Welsh priest who took him along the most difficult and inaccessible paths. 'Whenever they passed through lush woodlands, to the great astonishment of all present, [the priest] plucked a handful of grass and ate it, thus giving the impression that in time of need the local inhabitants lived on roots and grasses.' The knight reported to the King that the land was uninhabitable and the King made the local Welsh leader swear an oath of fealty but left him to his own affairs. N is for Newgale Sands Here in the winter of 1171-2 a great wind blew 'with such unprecedented violence that the shores of South Wales were completely denuded of sand, and the subsoil, which had been buried deep for so many centuries, was once more revealed. Tree-trunks became visible, standing in the sea, with their tops lopped off, and with the cuts made by the axes as clear as if they had been felled yesterday. The soil was pitch-black and the wood of the tree-trunks shone like ebony.' This wind was so fierce that it blew fish into the bushes and high rocks, and people came down to collect them. R is for Rhyd Pencarn. Near Newport, Gerald describes a stream that is 'passable only be certain fords, more because of the way in which it has hollowed out its bed and of the muddiness of the marshland which surrounds it than through the depth of its waters.' Rhyd Pencarn, the 'ford beneath the hanging rock', was the subject of a prophecy by Merlin Sylvester (Gerald believed there had been two Merlins in Wales - this one was Scottish). Merlin had said that the Welsh would not be beaten by a strong man riding over it with a freckled face, a description that matched the appearance of Henry II. When Henry did cross the ford in 1163, the Welshmen who watched his approach knew that they would be defeated. U is for the river Usk. Gerald says that salmon abound there in summer (whereas the Wye has them in winter). The finest salmon in Wales can be found in the river Teifi and there is a spot there called Cenarth Mawr where a waterfall roars unceasingly and the fish leap the height of a tall spear into the concave rock above. When Gerald and his companions reached Usk castle and preached the Crusade a large number of men took the cross, including robbers, highwaymen and murderers. The road then took them to Newport via Caerleon and they had to cross the river Usk three times. V is for the Valley of Roses. This was the site chosen for the cathedral of St David's. Gerald observes that 'a better name for it would be the Valley of Marble, for it is in no sense rosy or remarkable for roses, whereas there are plenty of rocks all over the place.' One of these rocks was used as a bridge over the River Alun and called Llech Lafar, the Talking Stone. One of the prophecies of Merlin held that a king of England who had just conquered Ireland would die as he walked over this bridge. As he had at Rhyd Pencarn, Henry II defied this superstition by boldly walking forward. Calling Merlin a liar, he entered the cathedral to pray and hear Mass. X is for Exmes. Gerald's digressions occasionally take him outside Wales itself - Exmes is actually a castle in Normandy. Near it there is a certain pool whose fish fought each other so violently on the night Henry II died, 'some in the water and some even leaping in the air, that the noise which they made attracted to the spot a vast crowd of local people.' This story parallels that of the two pools in Wales (see 'P' above), associated with the death of Henry I. Z is for Zeuxis. The Journey Through Wales ended where it began, in Hereford. After completing his account, Gerald wrote a second, shorter book, The Description of Wales. In its Preface he says that some readers of his earlier topographical writings took exception to the choice of subject matter. 'They see me as a painter who, rich in precious colours, the master of his art, a second Zeuxis, strives with great skill and industry to portray a humble cottage or some other subject by its very nature base and ignoble, when they were expecting me to paint a temple or fine palace.' But Gerald, on the contrary, was proud of having adorned the rugged country of Wales with 'all the flowers of my rhetoric'.